Does this sound familiar to any of you? 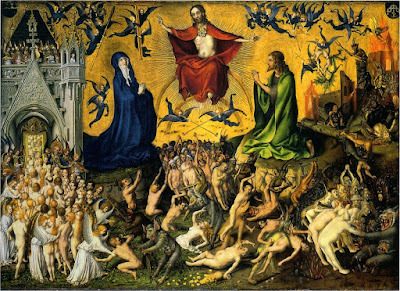 Well, if you had listened carefully to the English translation, you would have realised that this Latin poem evokes a frightening image of the Day of Judgment – it describes it as a Day of God’s wrath, a day when the world will be dissolved into ashes, a day when God sits as judge firmly and strictly investigating everything. Nothing will be hidden from his sight, no evil will remain unpunished. 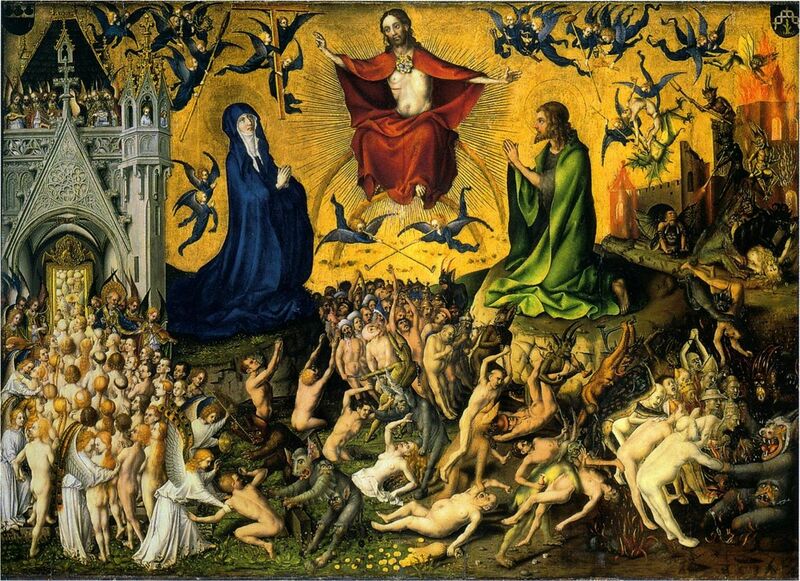 This frightening image of the Last Day, the Day of Judgment, would obviously not sit well with many today. In fact, this medieval Latin hymn, Dies Irae, which was a characteristic part of the Catholic Requiem Mass before the renewal of the liturgy after Vatican II, was removed from the present Catholic funeral liturgy, because some felt that the hymn was saturated with negative spirituality inherited from the Middle Ages. They felt that the song had overemphasised judgment, fear and despair whereas the funeral liturgy should actually be focusing on the hope and joy of the resurrection. So, the song got the boot! But, the issue does not just boil down to a song. It is the idea or the image of God that lies behind the song. An image that would obviously not sit well with a crowd of Catholics today, who would be expecting Jesus to look something like the picture of the Divine Mercy and the Sacred Heart, a Jesus with a kind, compassionate and gentle face with arms outstretched to give us a warm fuzzy hug, to welcome all of us, even the most wretched among us. We find it hard to reconcile a Jesus who is merciful and loving with a Jesus who sits in judgment of us. Perhaps, some would even cite today’s gospel, “Look, Jesus identifies with the weak, the poor and the marginalised.” This is the kind of Jesus whom we would expect to be our BFF, our Buddie for Life, the Jesus who seems to be just ‘an ordinary Joe’, not a cosmic universal king who will act as our final judge. This last image seems too alien and distant from us. But before, we come to a conclusion about the kind of Jesus whom we would like to worship, let’s listen to the rest of this hymn, especially the next stanza. I will just stick to English. It’s quite clear now that this hymn is describing the scene in today’s gospel, the story of how Jesus separates the sheep from the goats. Read on any other occasion, it would not be too hard for someone to conclude that the whole crux of the story is this: all it takes to get to heaven is to offer a cup of water to someone who is thirsty, because you may actually be offering a drink to Jesus, Himself. It is certainly a nice interpretation that reminds us of the responsibility of fraternal charity. Nothing wrong with this reading, but is it adequate? Do remember that this is a parable of judgment. More importantly, Christ is presented as a cosmic all-powerful king sitting on His throne and as a judge summoning the accused to trial. Perhaps, this setting is entirely lost to most of us because the gravity and seriousness of the Day of Judgment is no longer emphasised in our modern liturgy. In fact, the parable of Jesus presents two images of Christ, both seemingly at opposite ends of a spectrum. One image is that of a God who is transcendent, who is distant from us, who sits as king in judgment of us. The other image is an image of a God who is immanent, who dwells among us, who is in complete solidarity with us, and who identifies with us. The parable reminds us that both these images of Christ are not mutually exclusive. One does not cancel out the other. Our preference for the gentler image of Jesus betrays a certain prejudice on our part. The idea of a remote or formal king does not resonate with us. What we want is one whom we can identify with, one who is like us; an approachable, compassionate and gentle king. Unfortunately, it is not a matter of choosing one image over the other. Our Lord is that cosmic king seated on His throne of judgment – and there is a chasm which separates us lowly creatures from His august presence. Majesty which deserves worship and adulation is always marked by distance. You admire and worship someone only when you admire them from a distance, not when they are standing next to you and doing the same things as you. At the same time, this is a Jesus who has chosen to cross that chasm, knowing that no man nor woman will be able to make that journey; this is the supreme judge who understands that no mortal is able to bear the sentence for which he is accused, and who finally chooses to cross the distance from the bench to the gallery to take the place of the accused, the condemned in the dock, and to be punished and executed in his stead. It is easier to understand why the world requires a loving and compassionate king, a king who soothes us when we fall, a king who embraces us when we are lonely, a king who kisses our wounds to make the pain go away. Who wouldn’t want to have this kind of a king? But I believe Jesus came not merely to act as life’s panacea, a painkiller, for us. Ultimately, the world is in need of a king who calls and challenges them to greatness rather than mediocrity. The world is in need of a king who gives them a chance to experience the perfection and the holiness of the divine, rather than just being satisfied with our human weaknesses. The world is in need of a king who demands radical self-giving and loving, and not only when it suits us. The world needs a king to inspire us, not a king who looks and behaves just like us. Today, in our attempt to make God and the divine more accessible, for example, by transforming the sanctuaries of our churches into empty spaces barren of beauty, in the removal of communion rails, in the singing of music that approximates the kind of music we listen to in our daily mundane existence, there is something about the character of the liturgy that is lost – we lose focus of the object of our liturgy, which is to worship God. In place of this, man is worshipped in his stead. But it is not just liturgy which suffers. Christian life suffers too when we choose to depict Christ merely as an ordinary Joe. There is no challenge to aim for loftier goals. At the end of the day, when Christ becomes ordinary, He will soon be forgotten, since He only acts as a functional implement or tool whenever we need Him. As a priest friend of mine once said, “if we erase the distance, wipe away the blood and hide the painful suffering of the crucifixion and demythologise the divinity of Christ, we sanitise the image of our King to the point of an empty symbol.” We have reduced Christ to a mere panacea or an intoxicant that serves to make us feel good in our otherwise miserable existence. But, this is Christ, King of the Universe, the one whom we must subject ourselves to. This is Christ, the Judge, who will call us to account for our actions, and who would demand evidence that we had recognised Him in His people. This is Christ, our Lord and God, who chooses to come among us, God who becomes man in order that men may become gods. This is Christ who inspires us and reminds us that we are made in His image and likeness, a royal priestly people called to give glory to God. Let us not make the mistake of reducing Him into nothing more than an image of ourselves.